Parrot Analytics’ television demand measurement system is genuinely cross-platform; we measure country-specific demand for titles on VOD, SVOD, TVOD, AVOD, broadcast and linear TV networks. Our global demand measurement data is available for 100+ markets, taking into account the weighted average of global consumer activity, resulting in country-specific worldwide demand for television content regardless of platform. In our weekly US chart tracking television demand in the United States, the most in-demand TV series remains Marvel’s The Punisher from Netflix for two consecutive weeks. The superhero series has declined 15% in average demand since last week, despite the fact that it is the only Marvel/Netflix series that is currently airing new episodes. The Punisher only had slightly more demand than the next most in-demand title, DC Universe’s Titans. 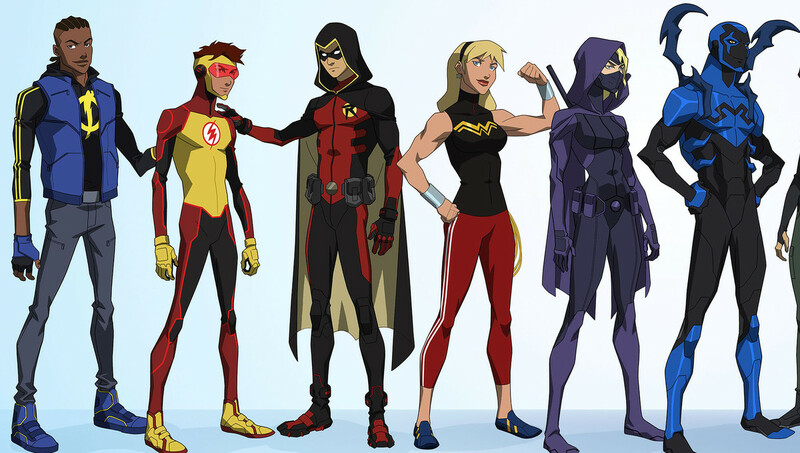 And while Titans and its companion Young Justice dominated the top two rankings in the prior week, this week both series dropped somewhat in demand as they are going into hiatus. 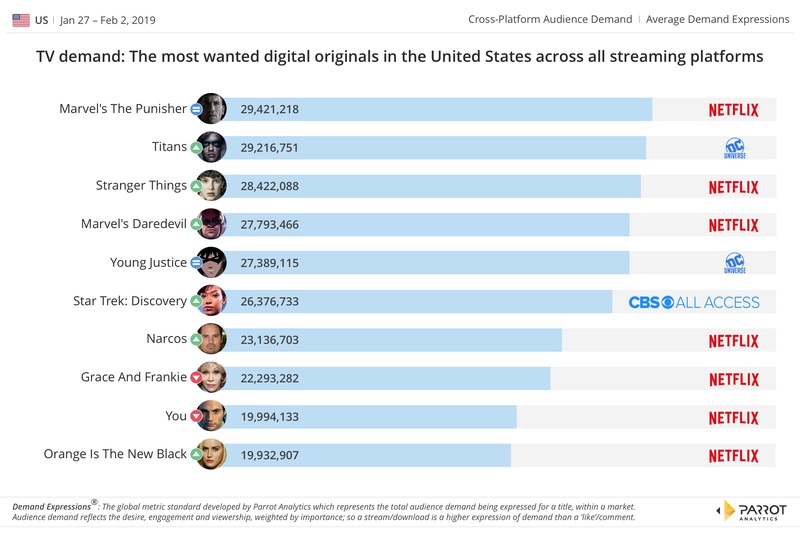 Elsewhere in the digital originals chart, renewed interest likely related to news for upcoming new seasons of both Narcos and You drove American audiences wanting to know more about their favorite shows. The same high attention has been given to the new season of Netflix’s Grace and Frankie; the only comedy series next to Orange is the New Black in our digital originals chart, with 22.2 million daily average Demand Expressions. Discontinued titles like Orange is the New Black (and Marvel’s Daredevil) are still making an impact in the chart this week. In the overall chart, for the first time in three years since this weekly television demand report has begun, the top nine titles have all stayed in the same position compared to the prior week. Seven out of the nine titles are currently on regular broadcaster’s schedule, while HBO’s Game of Thrones hasn’t aired since August 2017 and The Walking Dead will be back on February 10th. (Sidenote: The Walking Dead has recently won Parrot Analytics’ most in-demand show globally in 2018). NBC’s Brooklyn Nine-Nine, which moved to a different network, has had its highest demand in 2019 since airing on its parent network. None of the digital original series have materialized on the overall chart, indicating that there is continued strength in linear broadcast compared to digital-only series. It is also interesting to note that the demand for HBO’s Game of Thrones has registered the greatest weekly drop (-17%) compared to the other series in the top 10. 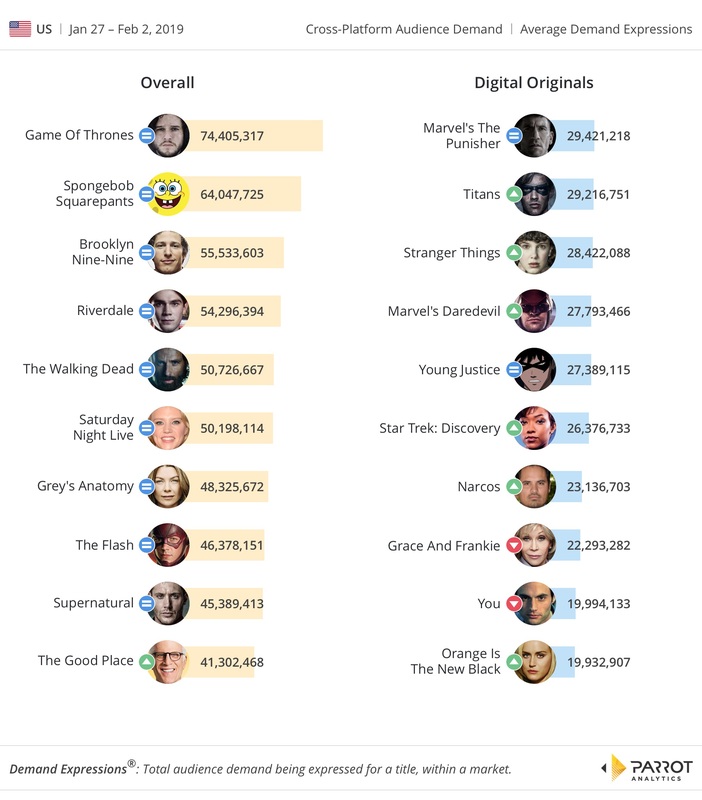 The only notable addition to the overall chart is the finale of NBC’s The Good Place; which jumped from No. 12 to No. 10.